Lifting Capacity 350 lbs. 350 lbs. Max. Scooter width 27" 35.5"
Max. Scooter wheelbase length 42" 48"
Installed Weight 105 lbs. 124 lbs. Hitch Height (range) 5" to 19" 5" to 19"
These heavy duty lifts have been designed to meet the need for a larger platform to carry today's extra larger scooters and power wheelchairs. 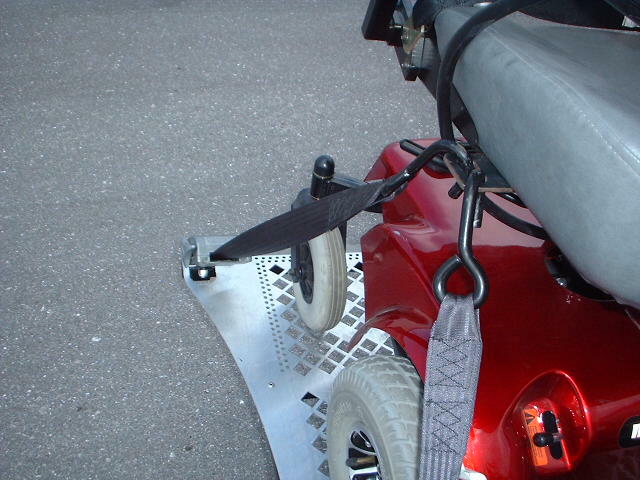 Both the AL 300 and 300XL are equipped with the unique tie down system that secure the scooter or wheelchair to the platform easily, without the use of pesky ratchet straps or bungee cords. 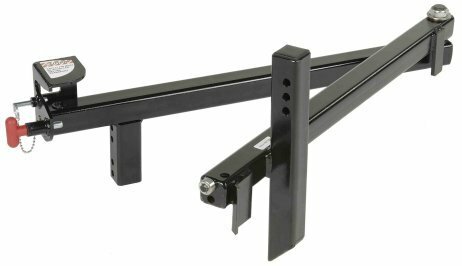 These lifts will work with a class 2 or 3 hitch. 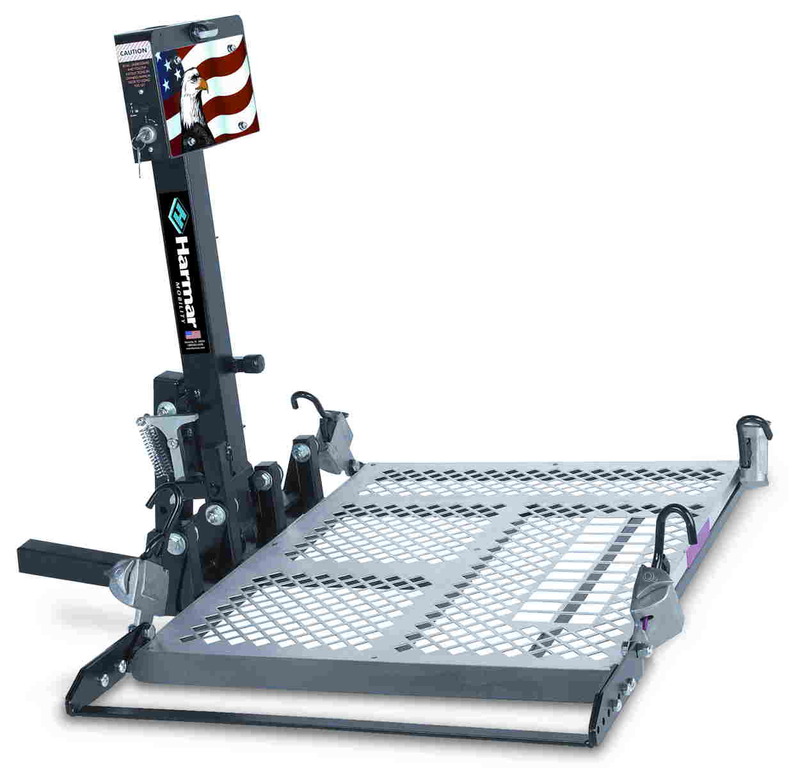 The Auto Lift 300 and 300 XL fold up vertically when it is not in use and have a perforated aluminum deck which greatly reduces wind resistance and allows for maximum visibility when driving. 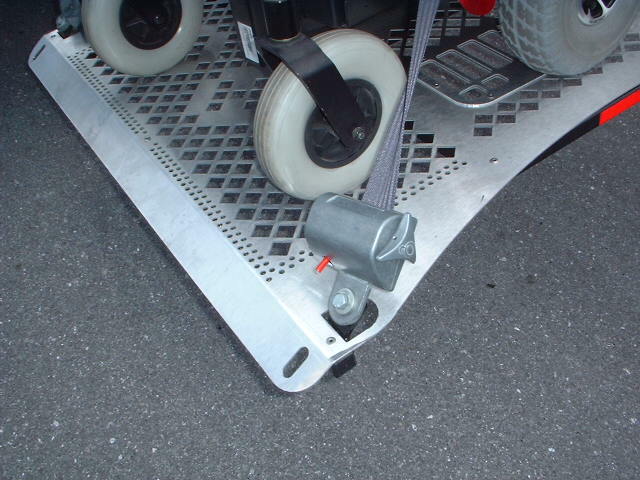 The swing away unit, pictured below, allows you to swing the entire lift to the side, when your mobility equipment is not on it, so that you can access the rear of your vehicle. Extra large platform for larger, heavy duty scooters and power wheelchairs. Fully electric lift folds automatically, vetically against the rear of the vehicle when not in use. Unique securement system easily and quickly locks the scooter or wheelchair to the lift platform. Swing away option is available to move lift to the side to easily access the rear of the vehicle. Simply drive your power chair onto the lowered lift platform, from either side. Flip the switch to release the tension on the straps and place the hooks on the end of the straps in the docking device on the chair. (docking device for chair is provided with lift) Pull the straps to tighten and lock in place to secure the chair to the lift. To remove the chair from the platform, simply flip the switch to loosen the straps, and unhook hooks from docking device and drive your chair off of the platform. The straps are reeled into the tensioning device automatically, so you don't have any loose ends! The lift folds vertically against the vehicle when the lift is not in use.